Toronto Real Estate Blog - GTA News : Divine 2 1/2 Story House For Sale On Park Lawn !! • 2 bath, 3 bdrm 2 1/2 story - MLS® $649,500 - Spacious Backyard! Park Lawn/Queensway, Toronto - Welcome To 223 Park Lawn! 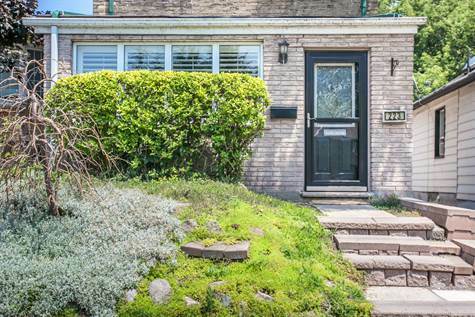 This Unique Home Is In Highly Sought After Toronto Neighbourhood. This Home Is A Bright Sun Filled Open Concept Living Space, And Renovated Throughout. Gorgeous Open Concept Layout With Stunning Wood Floors and Crown Moulding Throughout!! Lots of Windows Offering Lots of Natural Light!! Immaculate Kitchen With Stainless Steel Appliances and a Walkout To The Yard! Large Private Backyard With A Recently Built Deck - Perfect For Relaxing Or Entertaining Guests! There Is The Potential For Additional Living Space In The Spacious Unfinished Loft Or Complete As a Third Story. This Location Is Great - Close To Highways, Waterfront, Parks, T.T.C, Schools And Walking Trails. The Perfect Family Home Near The Lake!! Extras:Includes: Stainless Steel Appliances, Washer/Dryer & All Window Coverings And Electrical Light Fixtures. Brand New Roof. Framed Basement Allows Opportunity For Simple Fully Finished Rec Room. Call for a complete list of move in ready homes for sale today! Thinking of Buying a Home? Do You Have a House to Sell? Call Us for a Complete Buy and Sell Package and Save! Looking For Your Dream Home? Worried That it May Cost More Than A Million? Our Team of Professionals is here to help. Not Every Extravagant Home Costs More Than a Million. Find What You're Looking for with our team of professionals!